These camps, designed for those entering 9th through 12th grade in the fall of 2019, provide exposure to real-world problem solving in a team environment and provide opportunities to learn design skills that are applicable to many fields of engineering. The mission of the camp is to offer high school students an opportunity to participate in a creative challenge as they explore the world of engineering. The goal of the camp is to guide participants through a fun and rewarding hands-on experience of authentic engineering design practices. 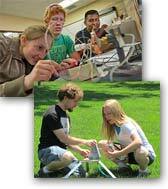 The expected outcomes of this program address the fundamentals of the engineering design process. A team spends the first two days brainstorming ideas, defining specifications, and selecting its best design. The team creates sketches (portfolio) and describes its designs (project plan). Once the design is approved, the team builds the apparatus from its drawings and specifications. On Friday it assesses the performance of its design. The Aeolus Wind project explores one of the major alternate energy engineering challenges of the century. Historically, farmers and ranchers used wind mills to pump water for irrigation or for watering animals. Today, the focus turns to the wind machine's ability to creatively capture the electrical potential of the wind. We challenge your team to design a system capable of capturing wind motion and converting the mechanical energy into electrical energy to light a LED bulb. Projects need to be aesthetic in order to educate the public on the potential of wind as an energy source. The Sky Hook Crane project will focus on lifting materials from a lower elevation to a higher elevation. Cranes are simple by design but perform tasks that at times may appear impossible. These machines lift large beams for bridge construction, or transferring whales from tanks back to the ocean. Sailing vessels offer a unique opportunity to explore cranes. A major challenge for cranes focus on providing a safe and comfortable access on a sailing vessel or evacuating people in wheelchairs quickly in the event of an emergency. We challenge your team to construct a mechanical device able to lift a weighted platform from a lower deck to an upper deck. The design must be automated to eliminate barriers such as a crank on the ship's deck. A control system provides a quick and easy method to automate the design. The system also provides a useful prototype for other control mechanisms and allows the crew to focus their attention on maintaining smooth operations during an emergency. The purpose of this challenge is to evacuate disabled people from the lower deck of a vessel and to provide a fast, safe, and comfortable process under emergency conditions. Dedi Sadagori has a complete academic background in engineering, finance, and economics. He has been an adjunct faculty member at the Colorado School of Mines since 2006 teaching Computer Aided Design (CAD) with SolidWorks™ in the Design EPICS program. Starting in 2015, he has been responsible for SolidWorks™ field session in the Mechanical Engineering Department at the College of Engineering and Computational Science. As of the end of 2016, more than 2000 students have been certified in SolidWorks™ (at the associate and professional level) under his instruction. Mr. Sadagori is passionate about teaching students at all levels. * Sessions I and II are the same camp, but offered at different times. This camp will introduce a tool to build parametric models of parts and assemblies, and how to make drawings of those parts and assemblies. Students will learn with a computer-based tool, through a software program called SolidWorks™ by Dassault Systems; which allows for creative modelling and visualization. SolidWorks™ is an integral part of engineering design and/or problem solving. Students who are interested in science, technology, engineering, and math will enjoy this course, because it will guide them to support and improve their 3D design skills and make their conceptual ideas come to life. The software is very versatile and fun to use, students will be excited by the challenges they are given. The opportunity to become a Certified SolidWorks Associate (CSWA) will also be given; this is an industry known certification that provides leverage. Camps may be cancelled if a minimum number of registrations is not reached. Register for one or more sessions and charge the full registration fee to your credit card online. Registration is limited to the first 25 students for each session. If a session has filled, you can place your name on the waiting list for the session.